Encouraging client retention and increasing rebook rates is key to a successful studio! One part of retaining clients and increasing your rebooking is to deliver a superior studio experience. The other part involves following up your clients who haven't rebooked, to ensure they come back time and time again. Before you know it, it has become a part of their lifestyle. If you are delivering a superior studio experience to your clients, then Simple Inked Client Retention functionality is the cherry on top! Your Simple Inked is very good at helping you retain your clients. Let's do it! We want to see those clients who have come in, but have not rebooked and who do not have any future appointments. We can then send them a promotional SMS or Email to encourage them to come back. Over in your Marketing section, click Clients Who Didn't Rebook. On the right side panel, change the From: and To: date to show the date range when the clients came in for an appointment. You can target clients for a particular Operator, or for a specific Service Category using the menus. 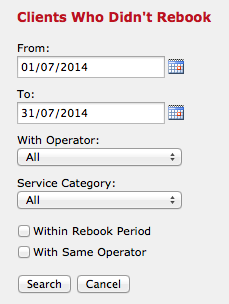 Within Rebook Period refers to the Target Re-book Period which you can set up in your Marketing Settings, in Settings. If the Target Re-book Period (in Marketing Settings) is set to 8 weeks, then this report will look at clients who haven't rebooked within the 8 weeks. With Same Operator, will give you the clients who had an appointment with an operator but who did not rebook with that same operator. Click Search when you're ready. 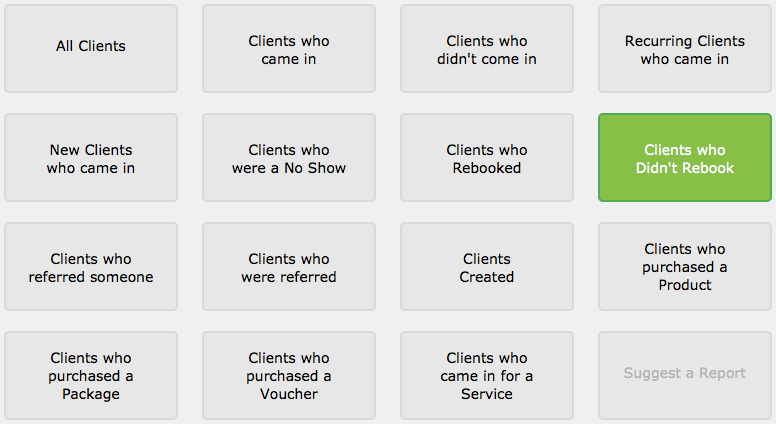 In this example we are targeting clients who came in last month and who did not rebook. It doesn't end there though. You can use the various filters to filter the list further. You can use your client Category, Gender, Referral menus to filter this report even further. You can Send SMS, or Send Email (in this case our client Michael Man doesn't have an email address, hence why the Send Email is not available). You can Export or Print the report. Even Add To List if you want to start building specific client lists to market to. Note: This information is the same as what the Client Retention Report gives you in the No column.